Helps Your Pets Heal Faster, Improves Pain, And Increases Mobility. How does it work? When the deep penetrating laser interacts with damaged cells, healing is accelerated. Eases pain and improves mobility without the use of pharmaceuticals and surgery. Provides geriatric pets relief of aches and pains, and allows for more freedom and improved quality of life. Relieves severe pain and discomfort instantly from everyday disorders such as lick granulomas and chronic ear infections. 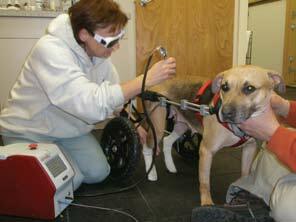 Additional Cold Laser Therapy Pricing/Specials: Each laser therapy package is custom designed and based on the individual needs of your pet. We are offering some introductory savings on special packages, please call us for details.